10 October 2017, Rome – The European Union is joining FAO and the World Organisation for Animal Health (OIE) in a global campaign to eradicate Peste des petits ruminants (PPR) - also known as sheep and goat plague - a highly contagious and devastating viral animal disease that causes major losses in regions home to millions of the world's poorest people. European Commissioner for International Cooperation and Development, Neven Mimica, agreed today to host in Brussels, during the first semester of 2018, a PPR pledging conference that will serve as a forum for countries to mobilize national investments and to confirm political engagements, and for the donor community to commit to support the PPR Global Eradication Programme. 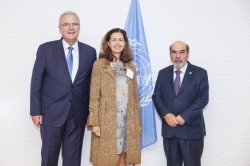 Mimica made the announcement during a meeting today with FAO Director-General José Graziano da Silva and OIE Director-General Monique Eloit. "I want to congratulate The World Organization for Animal Health and the Food and Agriculture Organization for their leading role in the work towards the control and eventual eradication of this animal disease,” Mimica said at today’s meeting at FAO’s headquarters. “We were strong partners in the global eradication of Rinderpest in 2011. Together in partnership we are committed to help pastoral populations, especially in fragile countries, where populations often rely on small ruminants for their livelihood," he added. FAO Director-General Graziano da Silva said: “PPR adversely affects livelihoods, food security, and employment, including for women and youth. It both entrenches and exacerbates poverty and malnutrition. In vulnerable countries and regions with high small ruminant smallholder populations, the loss of livestock can induce social and economic instability, contribute to the breakdown of civil society, induce conflict and in the worst case, even fuel terrorism." Since it was first identified in Côte d'Ivoire in 1942, PPR has spread to more than 70 countries in Africa, the Middle East and Asia -- in September 2016, Mongolia reported its first-ever case of PPR. Over 80 percent of the world's sheep and goats are found in these regions, where many families rely heavily on products like goat milk, mutton and wool for their nutrition and livelihoods. FAO estimates some 300 million small-scale farming families worldwide depend on small ruminants for food and income. The European Commission, FAO and OIE today agreed to be at the front line to achieve this benchmark, working with other partners and stakeholders, to support national and regional efforts to rid the world of PPR. In October 2016 FAO and the OIE launched a $996 million global programme as the first phase of what will be a 15-year effort to eradicate PPR by 2030. In all, the annual global damage due to PPR is estimated to be between $1.4 and $2.1 billion. While the disease is highly lethal to small ruminants —killing up to 90 percent of infected animals— it is easily preventable with effective and inexpensive vaccines that can be administered at low cost and will protect the animal for its entire life. Eradicating PPR will contribute to food security and nutrition, poverty alleviation, and strengthening resilience of the poorest people. It will play a key role in achieving the Sustainable Development Goals.